You are buying the Kendall Kangaroo Proximal Spike Pump Set Sterile DEHP-Free 36/bx, model #714600. ADW Diabetes offers a complete line of Enteral Feeding supplies like feeding pumps, feeding tubes, feeding bags, and the related nutritional supplements. Trust ADW for all of your enteral feeding products. The Kendall Kangaroo Proximal Spike Pump Set are Enteral Feeding Pumps Sets designed for use only with The KANGAROO ENTRIFLUSH Enteral Feeding Pump. Kendall features both 1000 ml feed and flush sets or 1000 ml bag and spike sets. 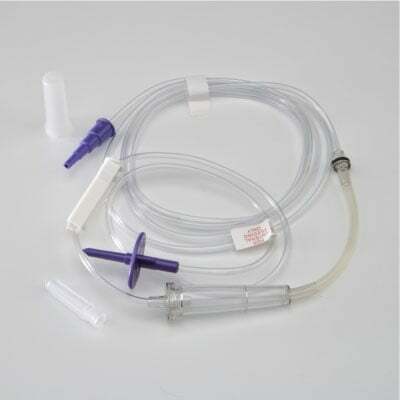 All of the KANGAROO ENTRIFLUSH Enteral Feeding Pump sets have an Anti-Free Flow valve that prevents formula from flowing directly into the patient when dislodged from the KANGAROO ENTRIFLUSH Enteral Feeding Pump. The KANGAROO ENTRIFLUSH Enteral Feeding Pump Sets are also available DEHP-Free.